These two recipes were sent to my parents by a Mrs. C.L. Brown of Santa Maria, CA. She thought this outstanding and unusual bean should be offered by our nursery. We have offered seeds of these flattened pick bean variety to home gardeners for more than thirty years and have always shared Mrs. Browns recipes. Method: After beans have soaked, bring them to a boil. Cover with three times as much water and soak overnight. Bring to a boil and immediately reduce heat to a simmer. Cover and cook 4 hours, or until tender. When Pinquitos are done, fry together bacon, peppers, onions, garlic. Add this mix to beans, season with salt and pepper. Cook an additional ten minutes. For my kitchen use I have modified the recipe as follows and must admit I’ve never prepared the original always coming to a halt at the entire pound of bacon. 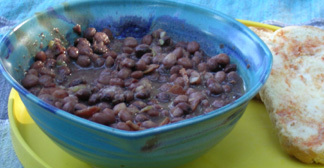 These beans have a distinctive texture and never fall apart when cooked. Method: rinse beans and place in pan with nine cups of water, . Soak overnight. Bring to a boil and immediately reduce hit to a simmer. Cover and cook for two hours or until beans are fork tender. Drain excess water from pinquitos, leaving one to two inches above beans. Place bacon into a large heated skillet and sauté until lightly browned. Remove bacon pieces and set aside. Drain all but one tablespoon fat from skillet and return pan to heat. Add garlic, onions and peppers to skillet and sauté, stirring steadily until onion is translucent. Add vegetables and bacon to pinquitos and simmer for an additional thirty minutes. Add salt and pepper to taste and serve. San Fernando Valley Pinquitos: by Mrs. C.L. Brown of Santa Maria, CA. Method: After beans have soaked, bring them to a boil. Cover, simmer 1 to 2 hours, or until tender. Drain. Prepare a combination of all remaining ingredients, being sure to mix sausage well with apples etc. Do not cook sausage first. Bring to a boil and mix wIth drained beans. Simmer for at least 2 hours. Serve with toasted garlic bread. I prefer lightly cooking the sausage and draining any visible fat. Do this slowly to avoid excessive browning.